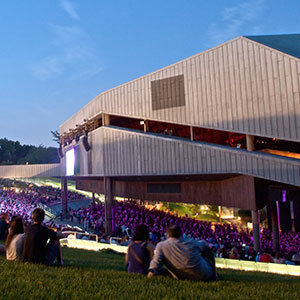 The Philadelphia Orchestra’s outdoor concert series at the Mann Center (pictured above) kicked off in grand style with British conductor (and droll wit) Bramwell Tovey conducting showpieces by Beethoven and Britten. Tovey, musical director of Vancouver Symphony and in demand with orchestras everywhere, also has palpable rapport with these musicians. He has been trotting down from Canada to spice up holiday concerts, often armed with backstage and even regional jokes, chatting up the audience so much that it’s easy to forget that he is also a robustly skilled conductor. On this occasion, Tovey left his funny maestro routine offstage, perhaps because seating extending by the hundreds out from under the venue’s stage enclosure isn’t conducive to such repartee. The Fab Phils regular season concluded with a three-week overseas Asian tour and musical cultural exchange in some remote parts of China. And notably, at the Mann, they did not sound season-end weary for the most part. Tovey opened with a very straightforward and (in moments) sterile reading to Beethoven’s Overture to “Egmont.” The violins particularly seemed underpowered, though depending on where you are sitting, it can be written on the wind. The orchestra only seemed to bloom in the middle of the piece. In contrast, Tovey elicited immediate clarity and cohesion in Benjamin Britten’s “Four Sea Interludes” from “Peter Grimes.” Britten’s swirling atmospherics worked aurally with the environs just as a breeze started. In the second movement, Sunday Morning, a baby was crying softly for a moment, and a few birds were chirping at the poetic thrust of Britten’s orchestral imagery. The orchestra held thrilling tempos in the descriptive Storm movement, but not at the expense of any detail, dramatically punctuated by those concussive chimes and roiling, oceanic lower strings. Beethoven’s Ninth Symphony is equally suited to be heard outside, and on such occasions, it can be like being in the presence of epic art, especially in perilous times. Tovey struggled with the orchestral cohesion in the first movement, marked with some jarring progressions, a wayward horn and hazy orchestral clarity. Whatever shifted in the pause going into the second movement, Tovey locked in on Beethoven’s profound symphonic architecture and its towering structures were conjured. The supple, passionate resolve in the third movement, so serene and stirring under the stars, reawakened deadened senses. The final movement, with the secular oratorio, was sung by soloists from Wolf Trap Opera Artists: Tracy Cox, soprano; Virginie Verrez, mezzo-soprano; Robert Watson, tenor; and Ryan-Speedo Green, bass-baritone. Green handled the tricky opening section, upper register baritone, followed by Watson‘s steeled tenor and thoroughly lustrous phrasing and tones from Cox and Verrez. It’s hard to single out the many outstanding solo lines, but I would be remiss not to mention Peter Smith’s ethereal oboe, almost an existential voicing from Beethoven. Tovey commandeered the sonic strings, upper and lower, with balance and power. Not to mention the percussive flank that shook the shed in key moments. Of course, the mighty “Ode to Joy” marches in and on this night, delivered by the mighty Choral Arts Society of Washington (under the direction of Scott Tucker), thundered with epically human grandeur.